John Wick: Chapter 2 is a forthcoming American action thriller film directed by Chad Stahelski and written by Derek Kolstad. It is a sequel to the 2014 film John Wick. The film stars Keanu Reeves, Common, Laurence Fishburne, Riccardo Scamarcio, Ruby Rose, John Leguizamo, and Ian McShane. The film is set to be released on February 10, 2017. 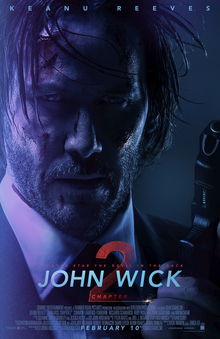 Plot: Legendary hitman John Wick is forced back out of retirement by a former associate plotting to seize control of a shadowy international assassins’ guild. Bound by a blood oath to help him, John travels to Rome, where he squares off against some of the world’s deadliest killers.